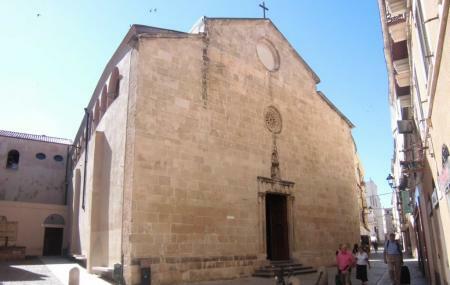 One of the finest examples of Gothic architecture that still exists in Alghero is Chiesa di San Francesco. Originally built in Catalan Gothic design during 14th century, it was later renovated with Renaissance influence after it collapsed in 1593. The buttery sandstone used in building the church, the hexagonal barrel on the square base with a spire on the top adds up to the beautification of the church. Step inside to see the 18th century polychrome marble alter and 17th century old wooden sculpture. The interior design follows Baroque style. The cloister with 22 columns connected like a round arch is a must-watch feature of the church. Dress decently while visiting the church. Ask The Locals About Mass Timings. People normally club together Cattedrale Di Santa Maria and Campanile while planning their visit to Chiesa Di San Francesco. Una delle più belle chiese del centro storico di Alghero, proprio per questo motivo mi ci sono sposata parecchi anni fa. La iglesia más bonita para visitar en Alghero. Construida originalmente en estilo gótico catalán en el siglo XIV, parcialmente fue remodelada en estilo renacentista parcialmente en 1593. Lo interesante es el altar del siglo XVIII y en la talla del siglo XVII del Cristo macilento, tiene un claustro del siglo XIV con 27 columnas con una serie de arcos. Las columnas y los arcos son de piedra arenisca.